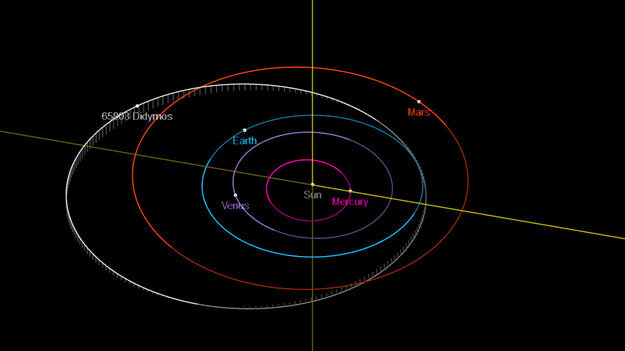 The opportunity arises because Hera will be flying out to match Didymos’ 770-day orbit, which circles from less than 10 million km from Earth to out beyond Mars, at more than double Earth’s distance from the Sun. 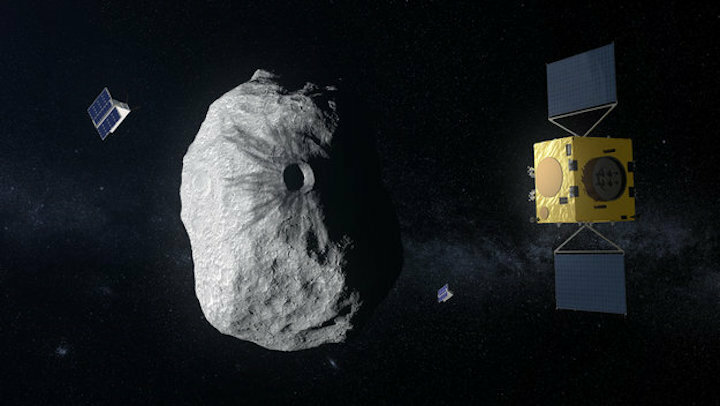 In the process Hera will pass both multiple near-Earth asteroids and the inner edge of the main Asteroid Belt. 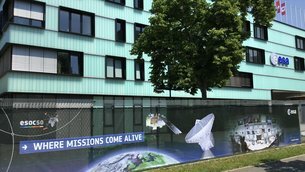 Initial studies at ESA’s European Space Operations Centre have turned up dozens of candidate asteroids across different mission scenarios. 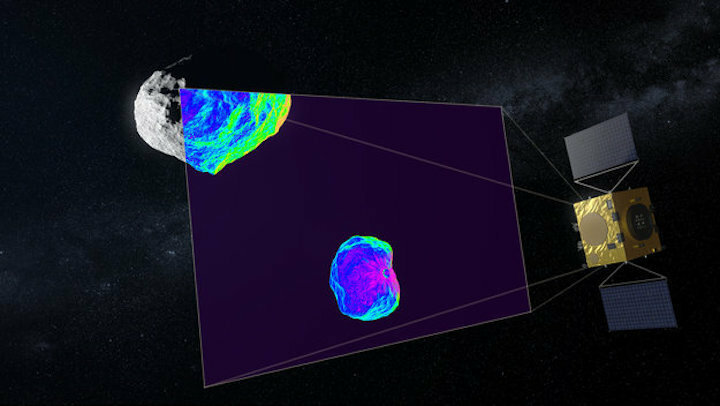 “Ideally we would like a flyby of another binary asteroid, to enable comparisons with Didymos,” explains ESA’s Hera project scientist, Michael Küppers. Take as an example one body researchers would like to see: the 2121 Sevastopol binary pair in the inner belt has an 8.6 km diameter main body with a 3.5 km diameter moon. This system is a member of the poorly understood ‘Flora’ family of main belt stony asteroids, produced by a collision event a relatively recent 100 million years ago – theorised to be associated with the Chicxulub impact that killed the dinosaurs. The next step would be to create a shortlist of targets, which could then be the subject of ground-based observations to determine more about their properties and sharpen knowledge of their orbits before Hera’s launch in late 2023. ESA’s Rosetta comet-chaser performed two asteroid flybys as it passed through the main belt during its decade-long flight to comet 67P/Churyumov–Gerasimenko, passing the 5-km diameter diamond-shaped 2867 Šteins and the mammoth 120-km diameter 21 Lutetia. 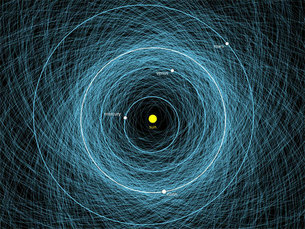 “To make flybys happen, we have to know where our trajectory will pass relatively close to asteroids if we do nothing,” notes Michael Khan, heading Mission Analysis at ESA’s Flight Dynamics division. “Then we tweak the trajectory to make a specific difference to that distance, bringing us much closer. “With Rosetta we had a lot of capability, because it was a large spacecraft with extra fuel in in the tanks to get the mission back on track in case something went wrong. Plus we were performing lots of gravity-assist flybys around Earth and Mars, and massaging those flybys slightly gave us a lot of freedom to manoeuvre. To compare the two missions, Rosetta was lorry-sized, while Hera will be the scale of a desk. 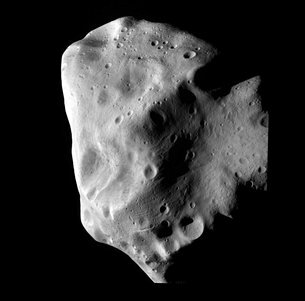 But any asteroid flyby would benefit its end mission as well as offering plentiful bonus science. Hera, Europe’s contribution to an international planetary defence experiment, is currently under study to be presented for approval by ESA’s Space19+ Council meeting of European space ministers. 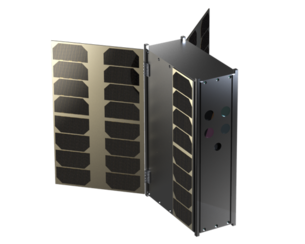 Hera is currently the subject of detailed design work, ahead of being presented to Europe’s space ministers at the Space19+ Ministerial Council this November. 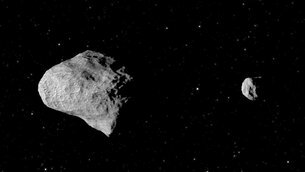 The spacecraft will survey a tiny 160-m diameter moon of the 780-m diameter Didymos asteroid, in the aftermath of a pioneering planetary defence experiment. “The spacecraft will operate like an autonomous vehicle, fusing data from different sensors to build up a coherent model of its surroundings,” says ESA guidance, navigation and control (GNC) engineer Jesus Gil Fernandez. 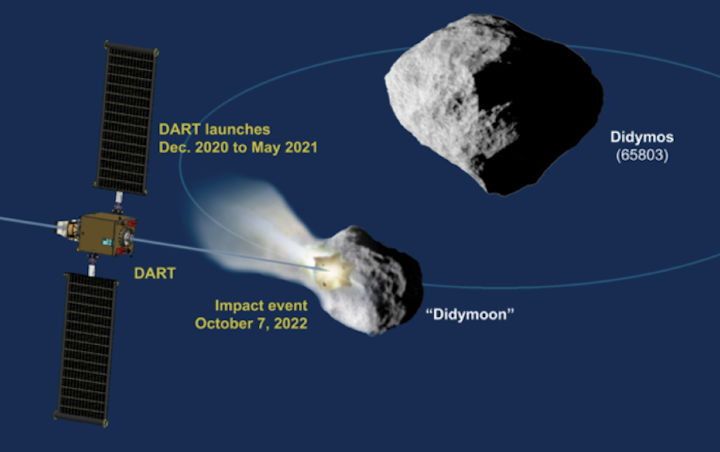 The resulting autonomy should let Hera navigate safely as close at 200 metres from the surface of the smaller asteroid ‘Didymoon’, enabling the acquisition of high-resolution scientific observations down to 2 cm per pixel – focused in particular on the impact crater left by the US DART spacecraft crashing into Didymoon to divert its orbit. 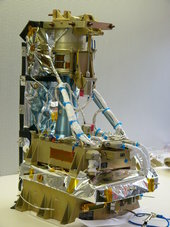 For maximum navigation reliability, Hera’s main onboard computer will be complemented by a dedicated image processing unit – in the same way desktop PCs often have separate graphics cards – while borrowing machine vision techniques from industrial cameras employed on production lines. 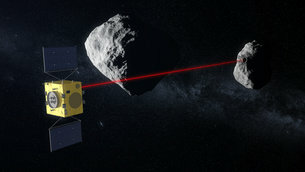 Due for launch in October 2023 and reaching its target Didymos near-Earth asteroids three years later, ESA’s proposed Hera mission will navigate itself in three different modes. On initial approach the main asteroid will appear as one more bright star among many. 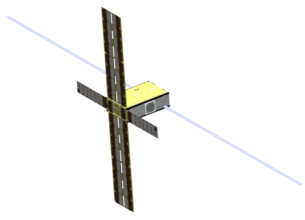 This imaging technique is similar to those developed to detect small items of space debris and to eventually permit future robotic debris-removal missions to rendezvous with them. 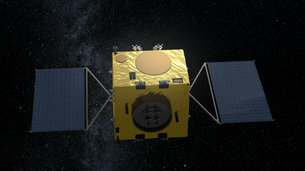 The next mode will be the dominant one for the bulk of Hera’s mission between 30 km to 8 km distance, with the larger ‘Didymain’ asteroid framed in its camera view as an overall reference point. 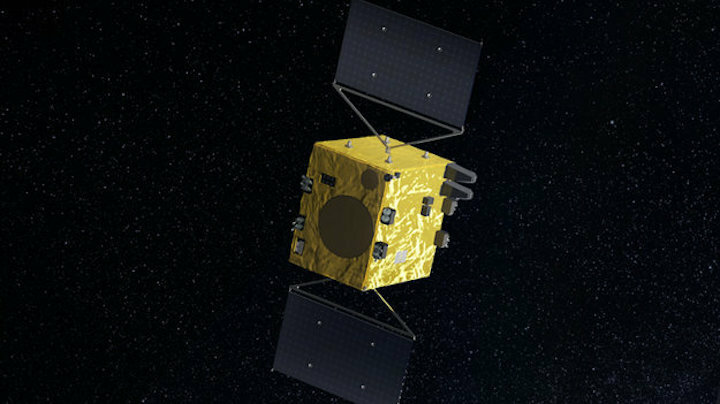 Didymain has been selected as the navigation reference point as it is the body where most of the system’s gravity is concentrated, and much more is known about it than the smaller Didymoon. 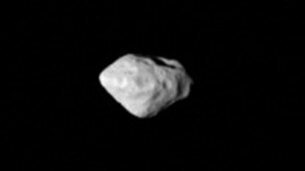 This method will become unworkable however once Hera comes closer than 8 km from Didymain, and the asteroid fills its field of view. Then comes the most ambitious navigation mode of all, based on autonomous feature tracking with no absolute reference. Feature tracking will also be used to measure the mass of Didymoon, by measuring the ‘wobble’ it causes its parent, relative to the common centre of gravity of the overall binary Didymos system. This will be achieved by identifying small metre-scale variations in the rotation of fixed landmarks around this centre of gravity over time. GMV in Spain is leading development of this vision-based navigation system, supported by OHB in Sweden with other partners including GMV in Poland and Romania. 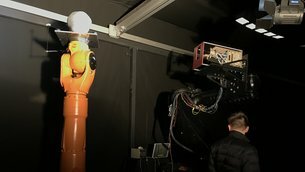 A replica of the Asteroid Framing Camera Hera will rely on is currently being used for practical testing of the software together with a high-resolution model of Didymos. This technology will have wider uses in many other missions, including ESA’s planned Space Servicing Vehicle for refurbishing satellites and removing space debris, as well as the ambitious Mars Sample Return mission, the homeward leg of which will involve autonomous rendezvous in Mars orbit. Ultimately, once proven, this technology would be an enabling building block for low-cost planetary probes into deep space.